Max & Ruby will be performing in the musical Nutcracker Suite in select provinces/states in Canada and US this holiday season from November 9th till December 18th. From August 21st to 23rd we can use the code ENCHANT to buy our tickets. Enter this Facebook contest for a chance to win 4 tickets to the performance. Download free activity sheets and learn more about the show and its locations/dates. 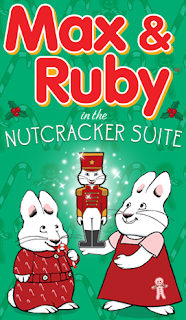 We are excited that Max & Ruby in the Nutcracker Suite will be coming to the Sony Centre For The Performing Arts (1 Front St. E Toronto M5E 1B2) on Saturday, December 15th at 1:00 p.m.
My daughters simply adore Max and Ruby .